LPC4350FET256 MCU: a dual-core ARM Cortex-M4/Cortex-M0 DSP microcontroller with 256 kB of SDRAM, Ethernent, high-speed USB and advanced configurable peripherals. 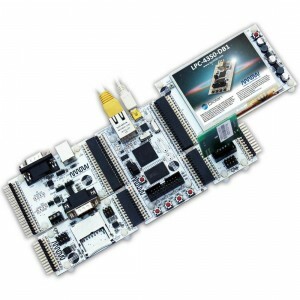 Evaluation board components: high-speed USB 2.0 interface, 10/100MBit Ethernet, 16MBit external NOR flash, Standard JTAG/SWD connector, 4 push buttons, RESET button and 4 LEDs. LPC1850FET256 MCU: ARM Cortex-M3 microcontroller with, 200 kB of SDRAM, Ethernent, two High-speed USB,LCD and external memory controller. Evaluation board components: High-speed USB port, 10/100MBit Ethernet port, 16MBit external NOR flash, JTAG/SWD connector, 4 push buttons, RESET button and 4 LEDs. LPC4357FET256 MCU: ARM Cortex-M4 microcontroller with Cortex-M0 coprocessor, 1Mb of internal Flash, 136 kB of SDRAM, 2 USB ports, Ethernent and LCD interfaces. Evaluation board components: USB 2.0, 10/100MBit Ethernet PHY, 16MBit external NOR flash, JTAG/SWD connector, 4 push buttons, RESET button and 4 LEDs.